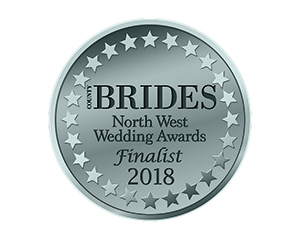 After getting engaged, Ashleigh and James were looking for the perfect Cheshire wedding venue – big enough to celebrate with all their family and friends and with overnight accommodation. 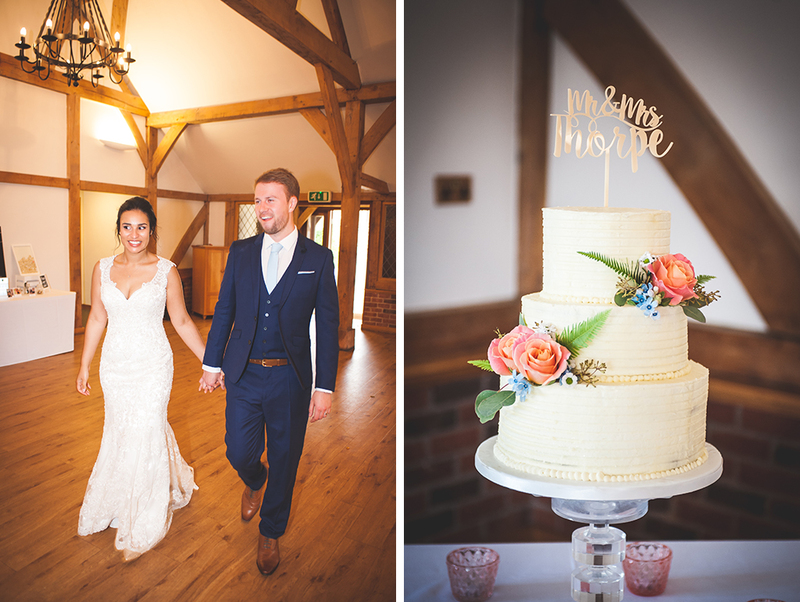 Dreaming of a barn venue with beautiful beams and high ceilings, when they saw Sandhole Oak Barn, they fell in love! 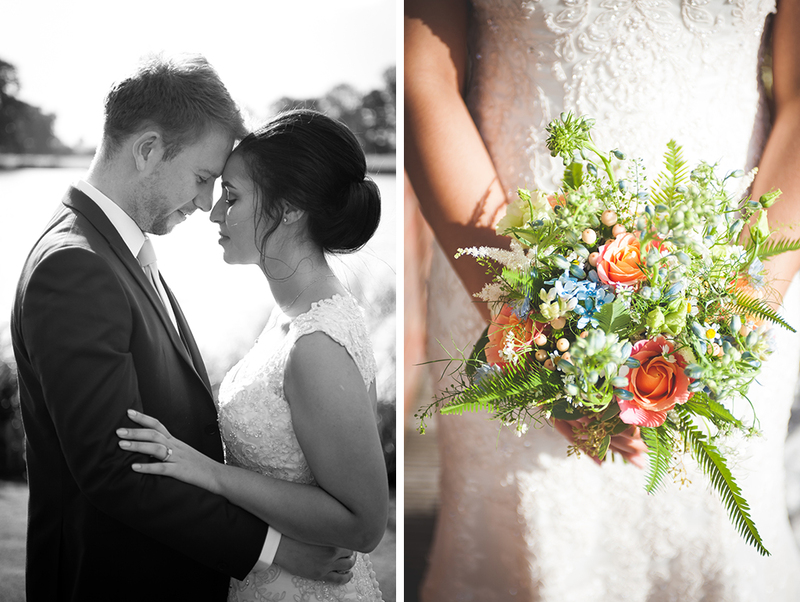 A beautiful colour scheme of pastel blue and white was chosen, along with a hint of coral. 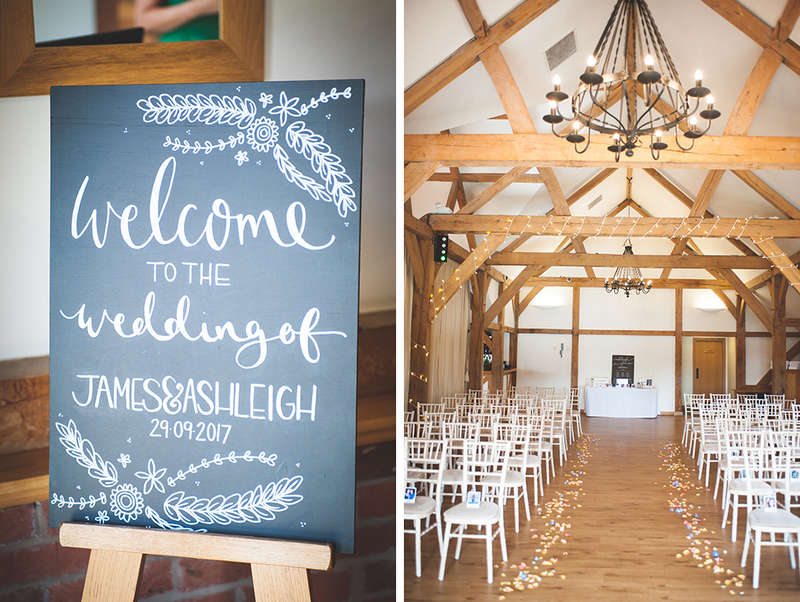 Decorations were kept to a minimum, allowing the natural beauty of Sandhole Oak Barn to shine through. 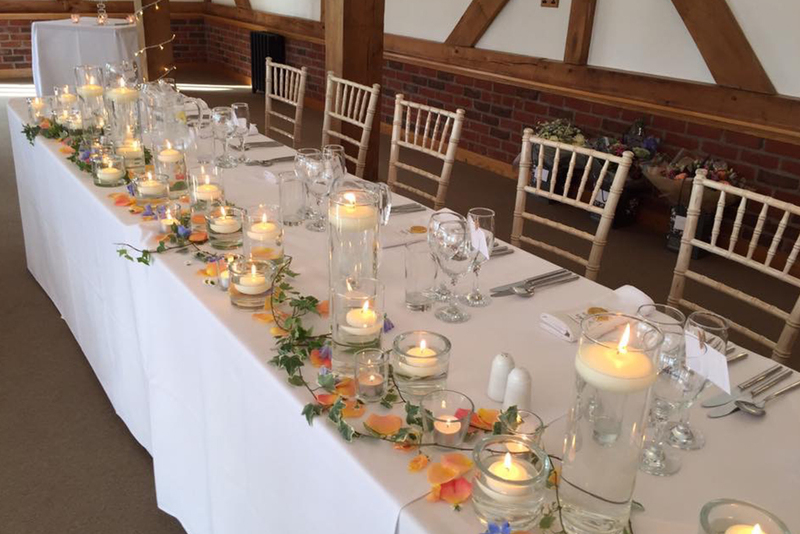 Rose petals were scattered down the aisle and the table centrepieces were floating candles and pretty flowers. The beautiful bride wore a beautiful ivory gown with lace detail and a keyhole back by David Tutera. Ashleigh wanted to look simple and elegant to kept her accessories to a minimum with a diamond pendant necklace made from her mothers engagement ring. She completed the look with diamond stud earrings and Champagne-coloured shoes with a touch of sparkle. 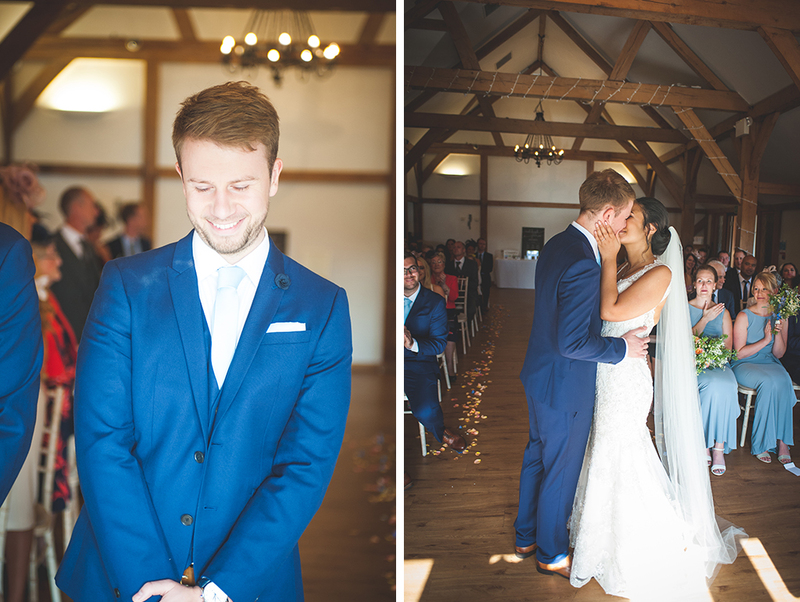 James looked the part in a royal blue suit with pale blue tie and white shirt from Selected. 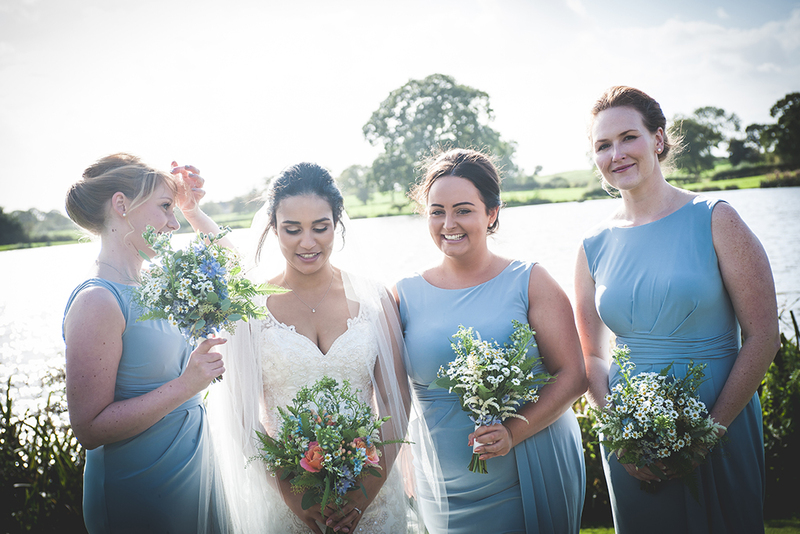 Meanwhile, the adult bridesmaids were beautiful in pale blue full-length gowns from Phase Eight while the flower girls looked adorable in pretty ivory dresses from Monsoon. 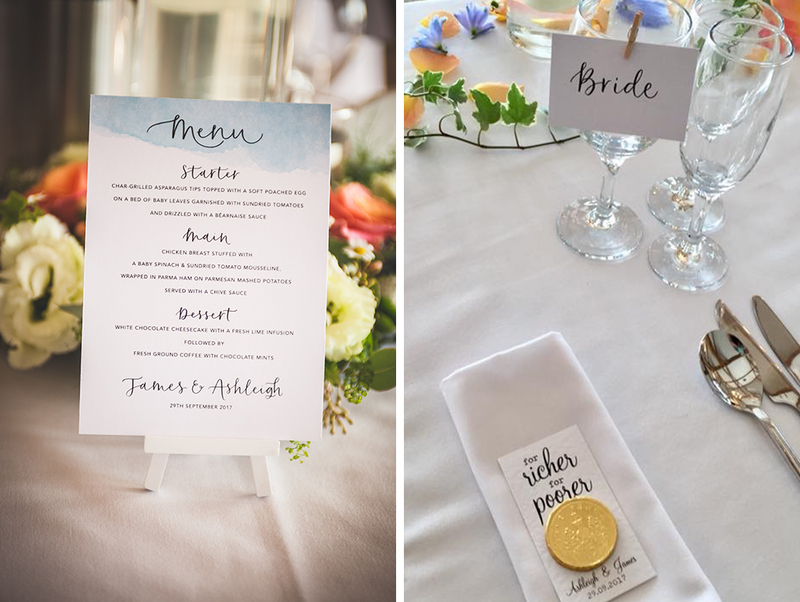 Following a romantic ceremony, guests enjoyed Pimms and canapés before the wedding breakfast was served. Starting with asparagus and poached eggs, the main course was chicken with parmesan mash and, for pudding, a lime and white chocolate cheesecake. As day turned to evening, roast pork sandwiches were enjoyed alongside the delicious wedding cake – three scrumptious tiers of chocolate, carrot cake and lemon. 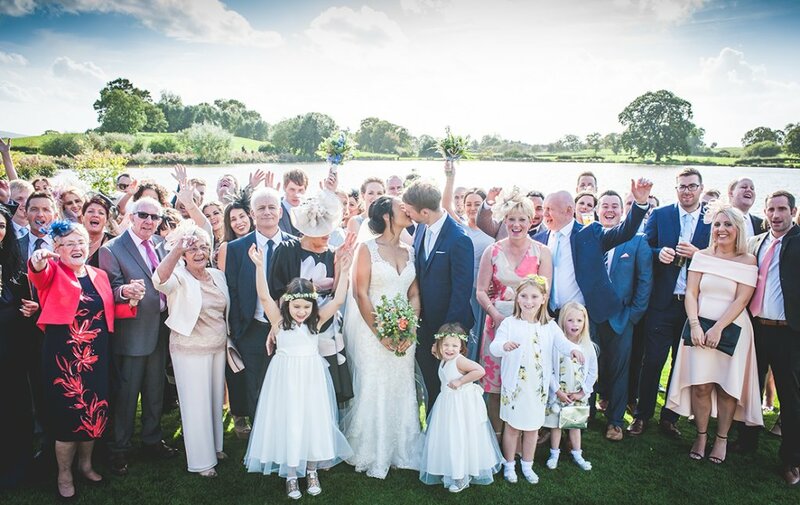 A pianist played the grand piano at Sandhole Oak Barn to welcome the bride down the aisle and as the newlyweds walked back up the aisle. He continued to play throughout the drinks reception and the wedding breakfast. 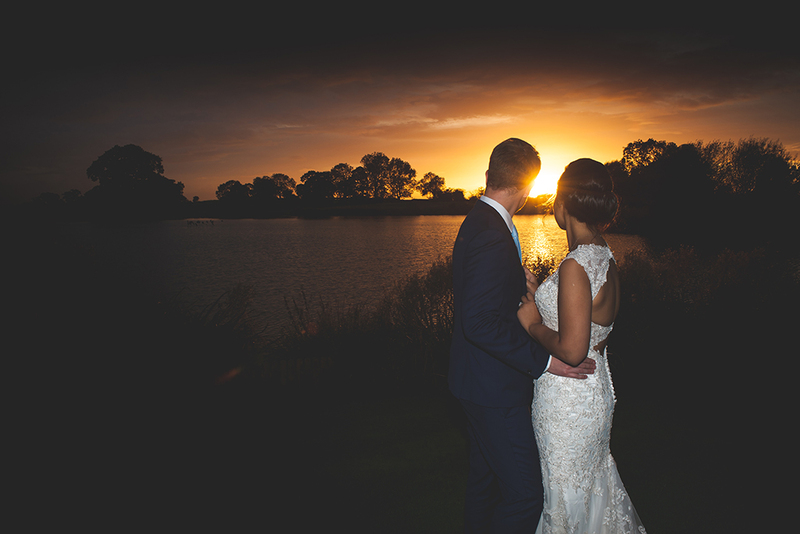 In the evening, a DJ filled the dance floor, playing ‘La Vie en Rose’ for the first dance.